Posted by hammeringjim on September 11, 2011 at 6:29 pm. Posted by hammeringjim on August 2, 2011 at 6:25 pm. American citizens are now waking up to a fourth branch of government. That’s right, in addition to the legislative, judicial and executive branch we now have a “Super Congress”. This new branch is a combination of the executive and legislative branch of government. 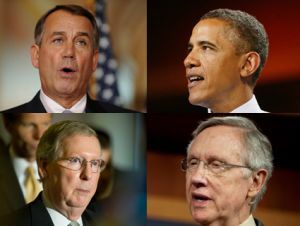 The new Super Congress was created by President Obama and republican leaders John Boehner and Mitch McConnell as a compromise in the debt ceiling debate. This new Super Congress effectively gives away our representation and creates a new level of misrepresentation in Washington DC. According to the agreement made in the debt ceiling compromise, after an initial 1 trillion dollars in cuts over ten years, the remainder of the budget cuts will be made by the new Super Congress. The Super Congress will be comprised of 6 republicans and 6 democrats. The President will join the Super Congress, making it a committee of 13. At this point, the selection process for the Super Congress is unknown, but you can be sure American citizens will have no part in the selection of members for this fourth branch of government. You can also be assured that congressional members who voted against raising the debt ceiling will be left off of the Committee of 13. This committee must make it’s recommendations by Thanksgiving of this year. The recommendations will be put up for a straight yes or no vote. No amendments and no filibustering will be allowed. If the recommendations are not approved then a series of previously mandated cuts will take effect. Effectively forcing the Super Congress’ recommendations down the throats of the congress and the American people. The Super Congress is nothing more than a power grab by the republican and democratic elite. Once again, your rights and your representation under the Constitution are being destroyed. How long will it be before this tyranny is stopped? Wake up America!